And finally it dawned on me that a decade of work, of research, of writing and re-writing, traveling, interviewing, digging and hoping is actually about over. Next March, if we hit all of our deadlines, a project with roots dating to 1975 will materialize. Thirty-five years ago, Missouri’s greatest 20th century artist died in his Kansas City studio. I remembered the mayor of Jefferson City, John G. Christy, had told me once about his run-in with Benton after completion of Benton’s mural in the House lounge at the capitol. I grabbed my SONY 110B cassette recorder and headed to the mayor’s office to record Christy telling me how he tried to get the mural painted over because he thought it ruined the peaceful qualities of the lounging room. Plus he didn’t think it was a very good painting. One of intriguing things about the capitol is that more than twenty paintings that decorate its halls were done by artists from Taos, New Mexico. When I found myself in Taos in 1982, I tracked down the daughters of two of those artists and with my trusty 110B, I recorded interviews with them. Without walking you through the next 28 years in detail, I’ll just say that somewhere along the way the idea occurred that somebody needed to write a book about the construction and decoration of our capitol. In the late 1980s, I got together with a University of Missouri graduate student named Jeff Ball who was writing about the capitol murals. He also had a dream of a book. Ten years ago, Tom Sater, who was working on restoration of the capitol (before the money got too tight to afford such things) suggested Jeff and I get together and write that book. Tom and I met one afternoon in the office of Senator John Schneider with Senators Wayne Goode and John T. Russell and worked out a bill creating a state commission to raise money to pay the costs of research and to raise money to subsidize publication of the book. The bill was the last one passed that year. From that day to this we have been working a book that would not stay written. Because the records of the Capitol Decoration Commission of 1917-1928 disappeared long ago, we have had to piece together the layers of stories of the art, the history of the events the art depicts, the artists, and the stories of their creation of the art. We’ve worked with sources stretching from London to Washington to Taos to San Francisco. We’ve read thousands of pages of newspapers on microfilm, deciphered—often with help of others—what are to us almost undecipherable scrawls that constitute letters from artists or from the commission chairman, followed threads and strings to capture a final detail for a story about a story about a story. We even found some of the papers of one of the decorations on eBay where they were being sold by someone who found them in a flea market. We’ve found that the paintings and the statues, the decorative windows and tapestries, have stories beyond the canvas, bronze, stone, glass, and cloth that decorate the walls. 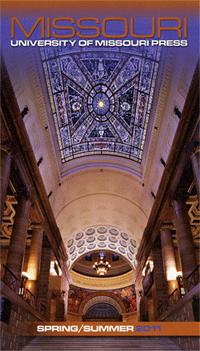 The human stories and the human history behind the decorations have absorbed our interests and our attentions. We’ve lost track of the number of pages or versions of the manuscript but the page numbers much be about 3500 and we’ve done at least six or seven versions of the manuscript. 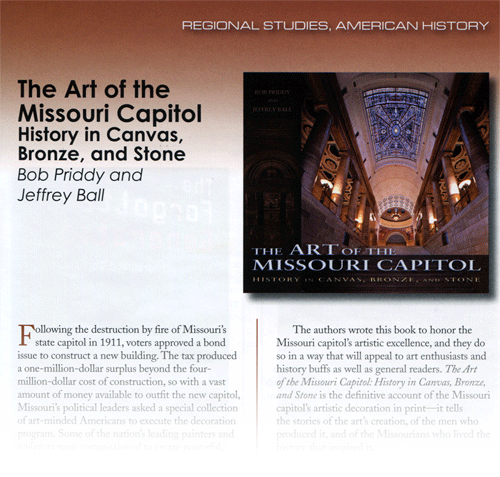 Less than a month ago we finally agreed on a title: The Art of the Missouri Capitol: History in Canvas, Bronze, and Stone. And how the catalog is tangible evidence that the book is going to happen. Here’s the page that talks about the book and shows the cover—a magnificent photo by Jefferson City photographer Lloyd Grotjan at Full Spectrum Photo. The book will have about 270 photos. The majority probably are by Lloyd and they are spectacular. University of Missouri Press encouraged us when we started and has stayed with us. The Second Capitol Commission has raised the money for the subsidy. Several days ago we sent our last version of the manuscript to the editor. We’ve given our list of photos to the UMP photo editor. Until last night, a decade of work was still pieces and pages, parts and pictures. This book is going to happen. It would be okay with Jeff and me if you bought one for yourself and others for all of your friends. We return you now to your regular blogging.